With the sun aglow, I have my pensive moods, 2017, two channel video, colour and sound. Cinematography Iain Frengley. When white Pākehā settlers arrived in New Zealand, they brought yellow gorse from the highlands of Scotland with them. Perhaps intended as a reminder of a homeland they would never return to, this invasive thorny shrub has leapt from hillside to hillside. Since it is adapted to encourage and withstand fires, flames often follow in its wake. In some ways the effects of colonisation are similar to that of disease. Even when the scourge has passed, the body has been altered. While the disease replicates itself in some other host, the survivor must get to know the body’s modified form. 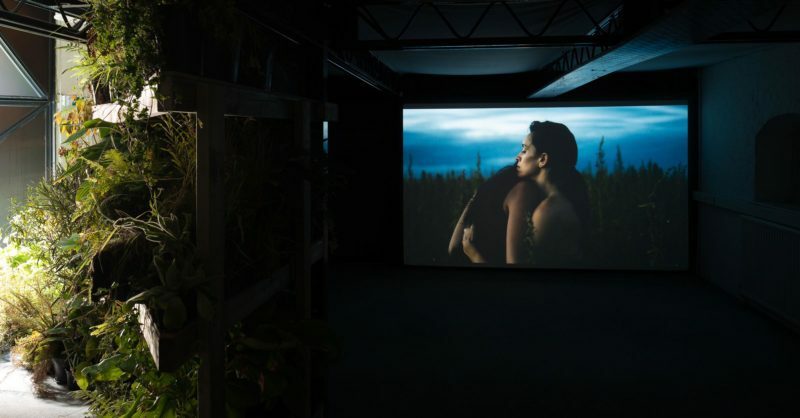 Being enveloped in the musty darkness of Shannon Te Ao’s video installation is a reminder that one’s lumbering body can appear fragile and strange. A large scaffold divides the building into a claustrophobic underground recess and a barren observation platform. Formerly a Magdalene asylum, an oppressive atmosphere like that of a correctional facility still lingers in the air. Moving through the space with autonomy is impossible. There are too few familiar points of reference in the dark. Keeping with this uncomfortable feeling of disorientation draws up a string of emotions that would otherwise stay submerged: the loss anger and sadness that are aspects of a colonial heritage. The cycle of the projection begins anew, revealing a dark skinned couple with wind-blown black hair locked in a dancelike embrace. They slowly circle round as the last of the daylight leaches out of the sky behind them. There is something forlorn about them, as though there is nothing more to be done but to cling to each other as the light fades. This might be their last dance together, or they might be dancing forever: a slow shuffling purgatory. The strict biosecurity laws in New Zealand, Te Ao’s home country, prevent travellers and tourists from bringing in ‘alien’ species that might spread in the wild. In Te Ao’s installation, the steps leading up to the scaffold platform are jostling with exotic potted plants. Perhaps these are native species of New Zealand, reared and pampered for the glasshouses of Europe; Te Ao needn’t ship his native flora in crates when he can buy successive generations of shoots and suckers straight from the shelves of any ubiquitous hardware franchise. The sound of the couple’s feet treading on the crackling vegetation is both a desiccated echo from a distant place and an uncanny presence in the undergrowth. A second projection shows an exposed landscape crisscrossed with pylons. This plain is the boundary of the tribal lands belonging to Te Ao’s people, but since it is used for training by the New Zealand army it is currently inaccessible. It is difficult to tell the scene wasn’t filmed in central Scotland, one of many wild vistas shrouded in atmospheric highland mist. Yet the syntax of spoken narrative that accompanies the image is curiously incorrect. The sensation of a voice speaking from an unfamiliar time or place is uncanny, precisely because the context looks so familiar. This narrative is a direct translation of a song written in the 1840s, which Te Ao has chosen to preserve the original word order of the Māori language. Spoken from the perspective of a Māori woman who contracted leprosy from an unrequited love, the disjointed images conjured up by this expressionless voice tell of the physical pain endured as the disease consumes a body that we cannot see. Instead, a succession of images of remote landscapes, crisscrossed with infrastructure, play out. The clues Te Ao gives as to how this landscape should be understood are subtle, leaving space for multiple interpretations. His placement of particular images and words side by side appears incongruous at first, but in this space a range of psychological associations are able to form in quick succession, without ever settling on one dominant theme. An image of a herd of cattle slowly chewing the cud in a grassy field is juxtaposed with spoken narration of spreading fire or a ‘flaming tussock.’ The cows seem completely oblivious to this emergency. Well fed and pampered. The dark humour of their situation subtly shifts the register of this idyllic pastoral scene. Composed nearly two centuries ago, the narrated lyrics are a poignant link to the past. The act of speaking these phrases aloud re-animates them in an altered present into which they cannot fit. Though their unfamiliar sequencing and tempo are curiously exotic, the question asked, ‘friends, what purpose is there?’ is an open one, just as pertinent now as it was then. Te Ao’s herbaceous bystanders, mute characters and stark landscapes offer no singular answer. His work is a reminder that we cannot forget the past, or make sense of it, though we carry it inside us wherever we go. Jessica Ramm is an artist and writer based in Edinburgh. She currently works at Edinburgh Sculpture Workshop and writes for The List.